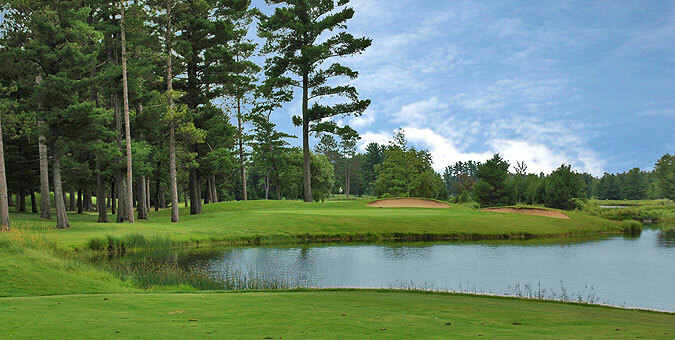 Garland Resort in Lewiston is one of the Midwest's top golf resorts, and affords golf buffs the opportunity to play 4 championship caliber golf courses, all conveniently located on one property. These include the upscale Fountains - one of Michigan's best, as well as the Swampfire, Monarch and Reflections. All four courses are serviced by one clubhouse, which features a wonderfully stocked pro shop, restaurant & lounge, with a wide variety of lodging adjacent to the courses. Swimming pools, saunas, whirlpools, a workout facility and other recreational activities are available on property. For detailed information on the resort accommodations and amenities including a link to the Garland web site, visit our page for Garland Resort by clicking here. Visitors will find a spacious grass & mat driving range with target areas, plus two enormous practice greens for putting and chipping - one near the range and the other conveniently located near the center of the resort. A good variety of instructional programs and lessons are available, and can be set up through the pro shop. 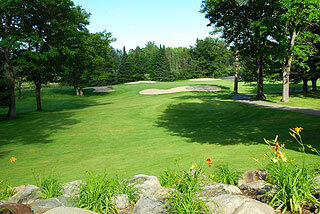 Golfers playing multiple rounds can pick up a quick burger or sandwich at the outdoor grill between rounds. There also is ample seating indoors at Tamaracks. Downstairs from the pro shop are locker facilities with showers for men and women. Reflections is a unique layout that features a great variety in hole design. One element that is consistent with the three other Garland courses, is the outstanding conditioning from tee to green. The "rustic" feeling I remember from a round on Reflections years ago, is no longer pertinent...In fact, work on the bunkers, fairways and greens in the past several years, has made the course one of the more finely manicured courses on property. Elevation changes and extremely rolling fairways are found on the opening holes, and then again in the latter portion of the back side. This type of terrain is not found in this extreme on any of the other Garland designs. There are also a great variety of doglegs - which as a group are difficult to cut. A word of advice - resist the temptation to cut corners, and play these doglegs to the wide side of the fairway. Playing this way will leave approaches that are not blocked by tree lines that often impair 2nd and 3rd shots from the close side. 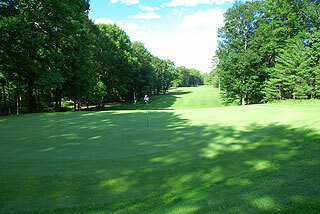 In between the early and late holes, golfers will find some level fairways flanked by mature trees and water hazards. Four sets of tees provide golfers with the choice of playing from the tips at 6373 yards/132 slope, the whites at 5935/129 slope (a fair challenge for average golfers) the golds at 5158/123 and the forward tees at 4713/118 slope. As with the other Garland courses, 100, 150 and 200 yardage stakes a visible on both sides of the fairways, and some sprinkler heads are also measured to the center of the green. Yardages are provided on the tee boxes of par threes, and the days pin placement can be ascertained from informational sheets available on all carts. Yardage diagram cards can be purchased in the pro shop for $1.50 - a good investment. The opening hole is a bit intimidating, and will require two excellent shots to reach in regulation. There is plenty of room off the tee, but the approach plays 2 clubs uphill to a challenging green complex. The second is a short par five that doglegs left and plays uphill. Most golfers should stay right center of the fairway, as only the longest hitters will be able to cut the corner to the left. The fairway ends near the 200 yard marker. 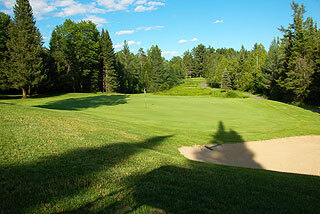 The approach slopes downhill past the 100 yard marker to a putting surface guarded by two bunkers in front. Three presents an extremely rolling fairway and is slightly uphill off the tee, with a flat lie available in the area between 140-165 yards away. The path to the green from here roller coasters up and down with only limited sections providing even lies. Long is also trouble. The well bunkered green on four is also crowned, creating the need to aim for the center. 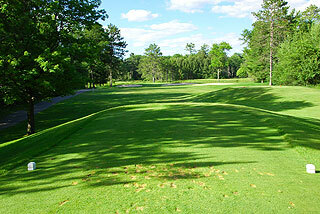 This par three precedes a long par five that plays from an elevated tee to a pine lined fairway. There is water on the right off the tee and the hazard also crosses the fairway about 275 away on the left, and about 230 away to the right, After another section of fairway, the creek crosses again near the 150 yard area. Six is a par three that is all carry over water, with the hazard also running along the right with trees situated left of the putting surface. 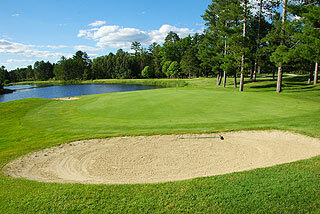 A huge bunker comes into play in the 140 yard area on seven, with water situated along the left squeezing the fairway. Greenside, there is a deep sand trap front left, with a little bit of room for error long to that side. The first open, level fairway on Reflections is evident off the tee on eight, which turns to the left near the 200 yard marker. The closing hole on the front is a beautiful par three from an elevated tee to a very well bunkered green, with water long. 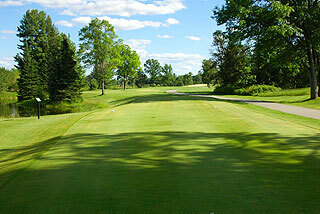 The back side begins with some fairly level fairways than finishes with more undulations and elevation changes. 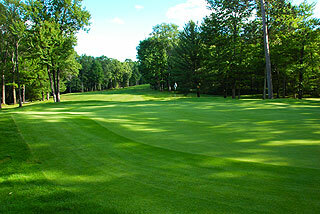 The tenth demands a short carry over water to a fairway that is tree lined all the way to the green. Eleven is a gorgeous three par with layered bunkers that from the green, and a natural area situated between the hazard and the forward tees. Take an extra club here! Twelve presents an ample fairway that bends to the left, inviting a tee shot to the right center - for all but the longest of hitters. This layout doglegs about 225 out, with the approach playing one to two clubs uphill with plenty of room greenside. The fairway is also generous on 13, although bunkers line the right side form 120 yards in. The tree line again blocks a cut on this par four. Fourteen presents an extremely tight landing area with the right center again providing the most opportune target area. The approach is uphill, and well guarded by sand traps. 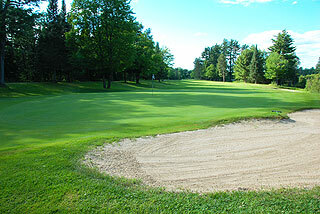 Fifteen is also tree lined with fairway bunkers located in strategic landing areas. Split the traps with some distance, as the second shot bends left to a fairway that is extremely undulating from 150 yards in. The par three 16th plays downhill with bunkers short and water deep of the putting complex, and is followed by a challenging dogleg left par four with trees on the left positioned to block an approach from that side. The green is well protected by sand bunkers. The pretty par three 18th plays downhill with ample room for error greenside, and gives golfers the opportunity to finish the round with a good score. The Reflections course is a beautiful layout that features some spectacular holes. It certainly provides some variety tot eh Garland golf experience. We had the opportunity to spend two nights at Garland, played all four courses, practice facilities, enjoyed the pool areas, restaurants and lounge, and highly recommend this place to anyone who has never had the opportunity to visit. The amenities and service are great. Visit our information page for the Reflections course by clicking here.